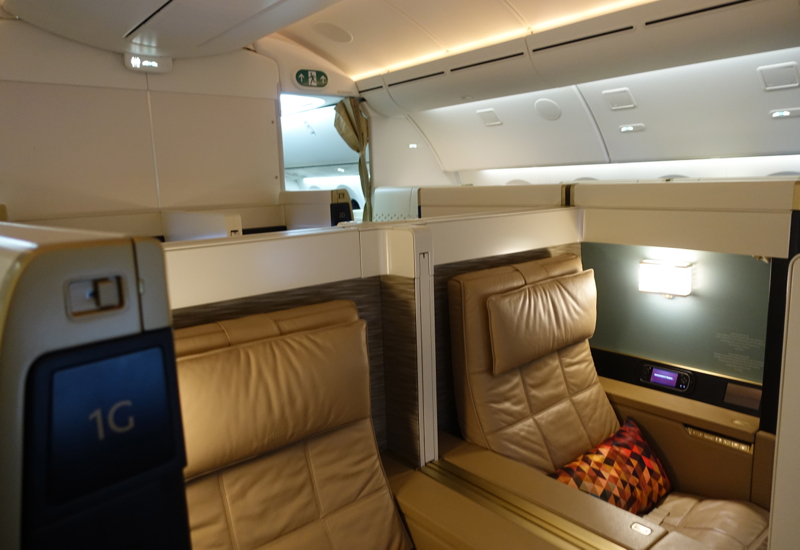 This Etihad First Class 787-9 Review is part of a trip report including luxury resort stays in Abu Dhabi, the Maldives and Southeast Asia. 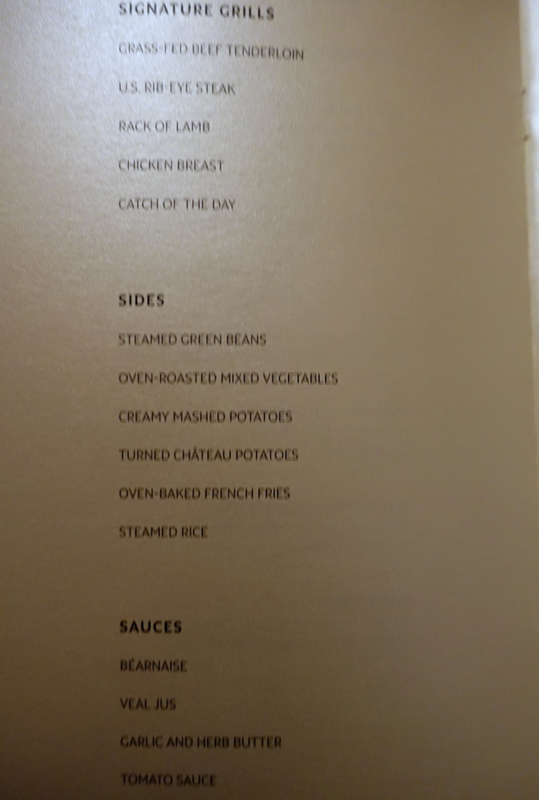 For the prior post, please see my Review of Etihad's Lounge at Washington Dulles Airport (IAD). 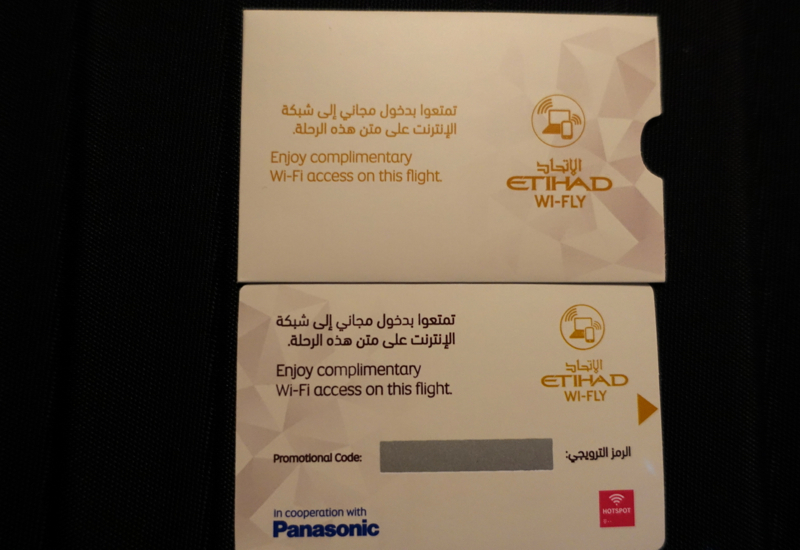 We last flew Etihad First Class via Abu Dhabi a couple years ago on our return from the Maldives, and it was a very good in-flight experience, so I was looking forward to flying it again to see if it measured up, or if there was anything better or worse this time around. Etihad offers complimentary Etihad Chauffeur service if you book it in advance, which I didn't, since originally we had a JFK-IAD flight booked. Well, that flight was cancelled hours before our departure (see JFK Runway Reconstruction: Delays and Cancelled Flights Through 2015) so we instead made our way to IAD using multiple modes of transportation: taxi, Amtrak Acela service, the Washington DC metro, and Silver Line Express bus service to IAD. 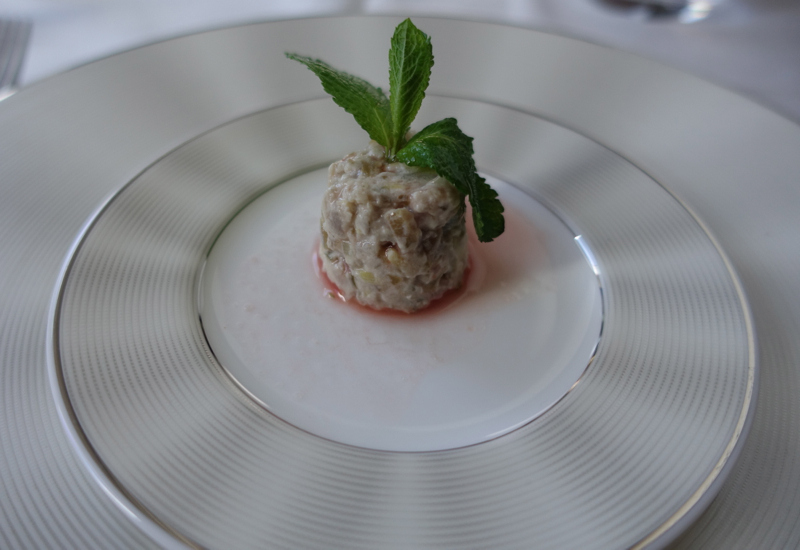 We were thrilled to finally make our flight, and even be able to enjoy a pre-flight supper in the Etihad Lounge. 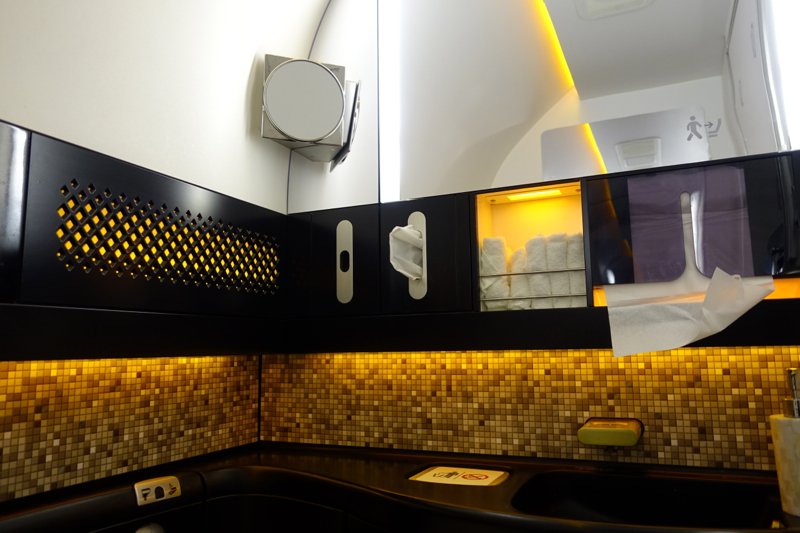 Etihad's 787-9 First Class cabin features 8 enclosed suites, in a 1-2-1 configuration. The two pairs of couples suites in the center are nice in terms of being able to talk with a partner, although it also means no window access. 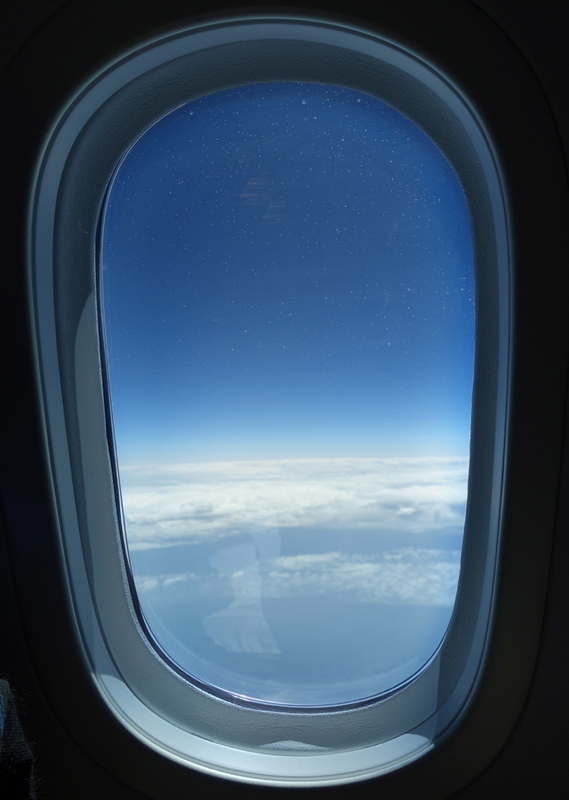 Since my son loves having a window seat, I booked us in 1K and 2K window seats, one behind the other. Keep in mind that several seats are rear facing: 1A, 1K, and 2D and 2G. The ottoman also serves as a storage compartment, which is critical since there's no overhead storage. 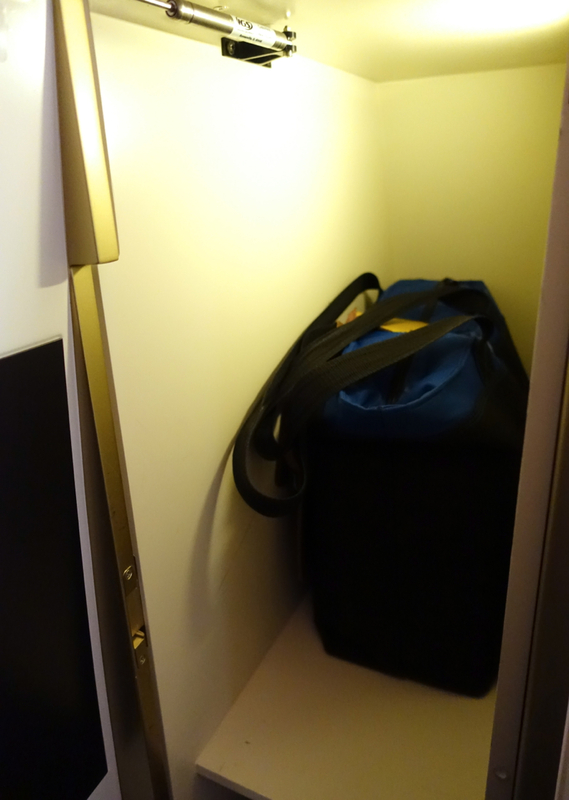 There was a closet, where I was able to store one of my bags, and the flight attendant took my rolled carry-on, since it fit neither in the closet nor under the ottoman. 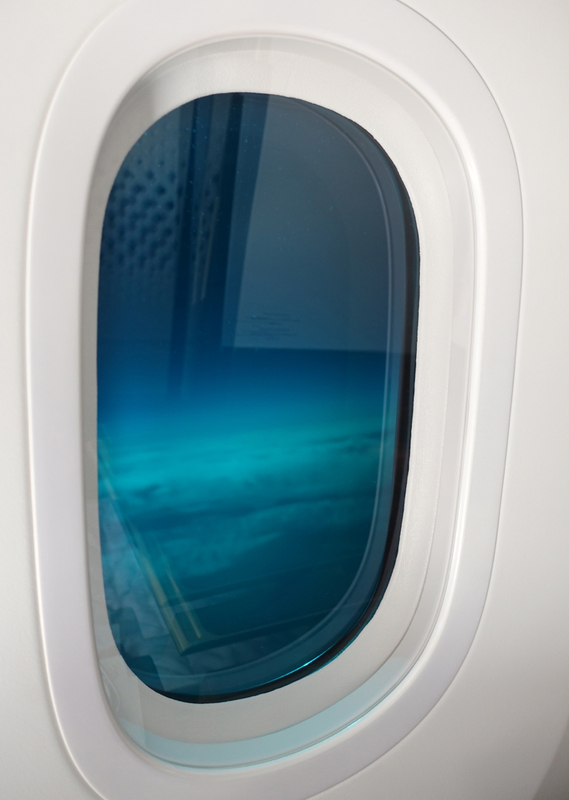 And also the tinted window, which blocked out a fair amount of light, but not all of it. Personally I would have preferred a way to block out light entirely, as “cool” looking as the tinting is. 4. 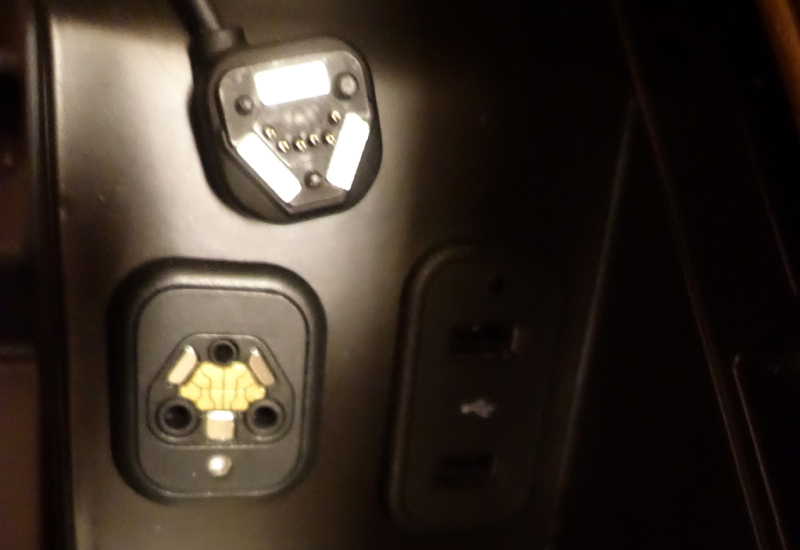 Magnetic connector for the headset cord: This was perhaps the most annoying feature. The headset cord had a magnetic connection, instead of a pronged connection, and as a result, there was often either a staccato beat sound or a high pitched wail that was hard to impossible to get rid of. Major fail, and perfect example of form over function. I've raved about Etihad's First Class pajamas (see Best Airline Pajamas) which, thanks to the Swarovski crystal adornment and satin trim, have made the pajama top a favorite dressy piece in my wardrobe. 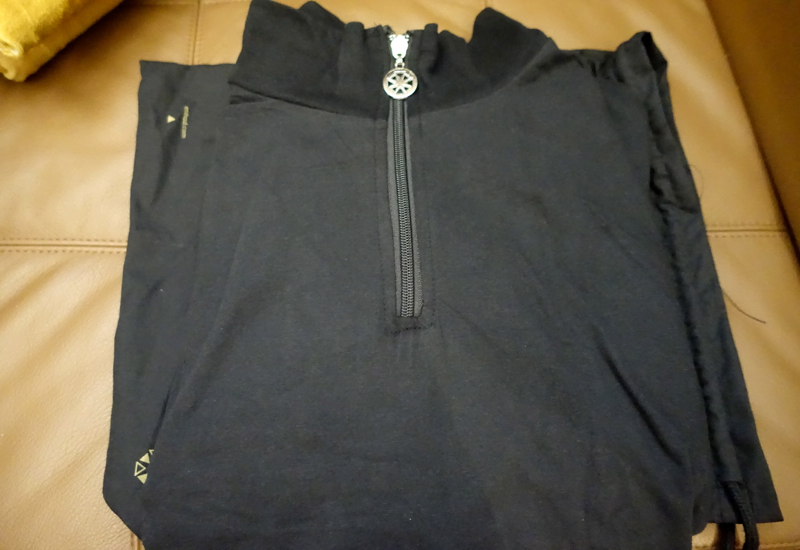 I was really hoping to pick up another of these tops, but of course in the intervening time, Etihad has changed its pajamas and the new version isn't anything special, just another black cotton top. 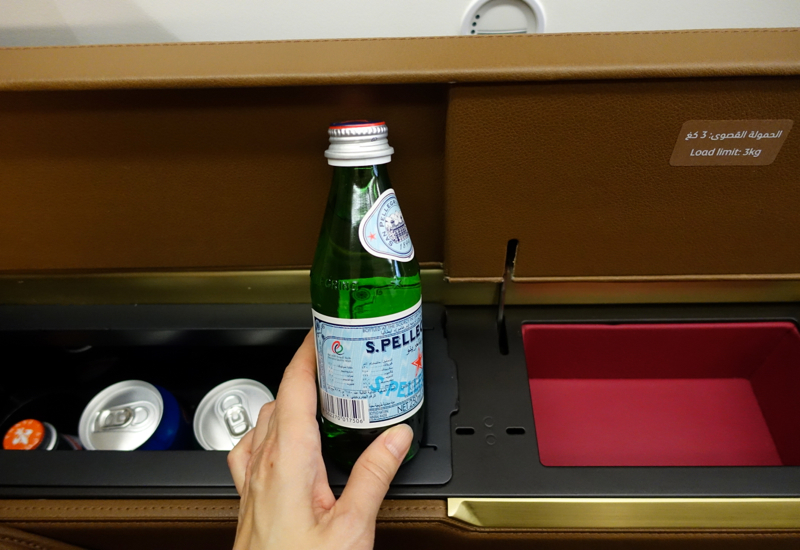 Etihad's amenity kit is also a weak point, especially compared to the Bulgari amenities Asiana First Class offers and SKII products in the Qantas First Class amenity kit. 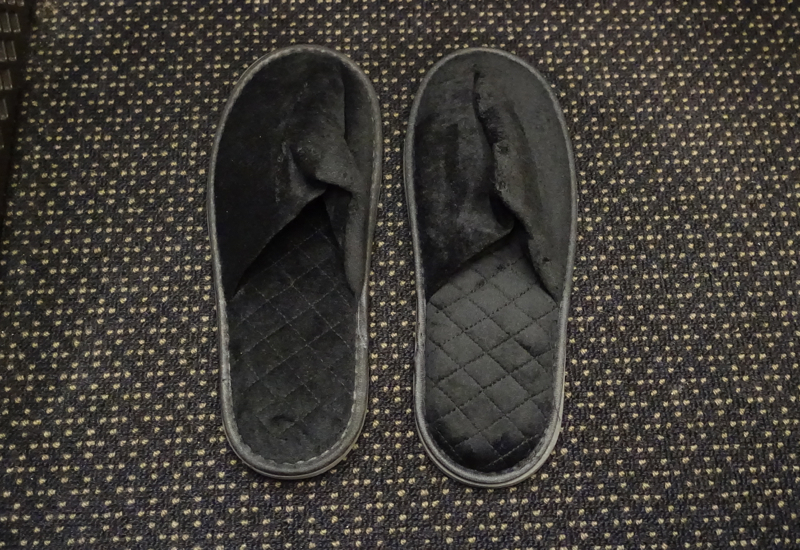 Probably the nicest aspect is that it can be reused as a clutch, but so can many other airline amenity kits. 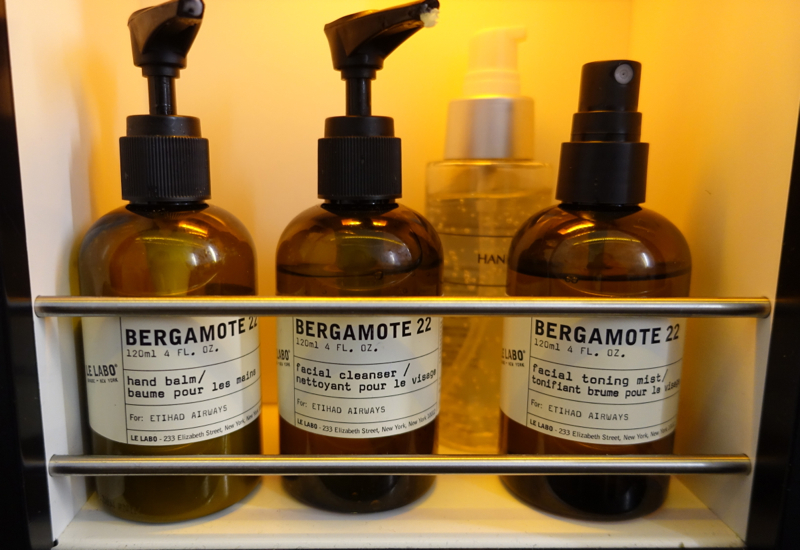 There are Le Labo refreshing towelettes, but rather surprisingly, no facial moisturizer, hand cream, etc. The only other thing I do like about it is the little case for the earplugs. I've reused it as a handy case for my preferred ear plugs, since I've never found the little disposable earplugs that airlines give out to be of much use. 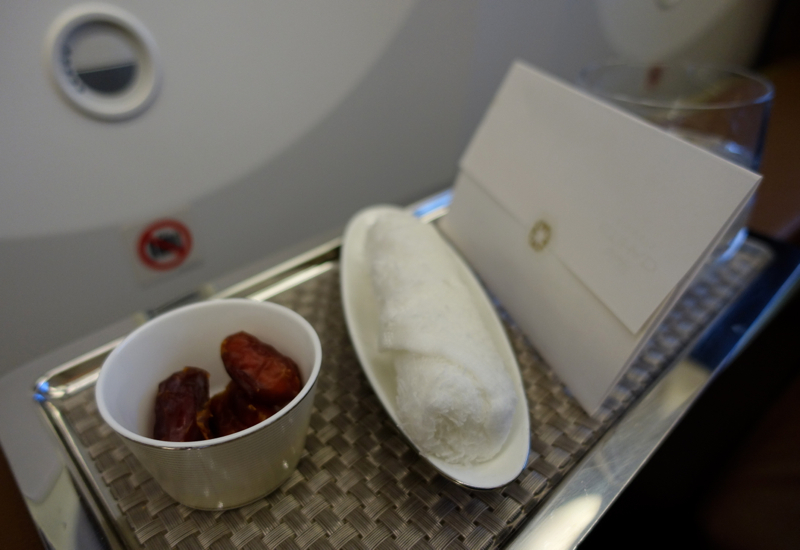 The first refreshment offered to you on Etihad, in addition to a pre-flight drink, consists of plump dates. This was accompanied by a refreshing towel, and Arabic coffee was also offered, although I declined since I wanted to get the best sleep possible. 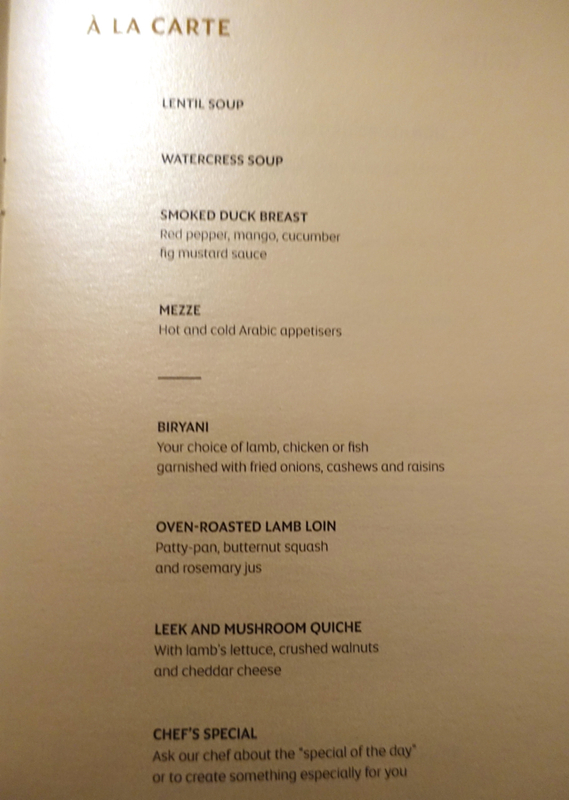 Etihad likes to market its onboard chef in First Class, and while I believe most all the food is pre-prepared as on other airlines, I will say that there are little touches such as presentation and palate cleansers that are better than on other First Class products I've flown. 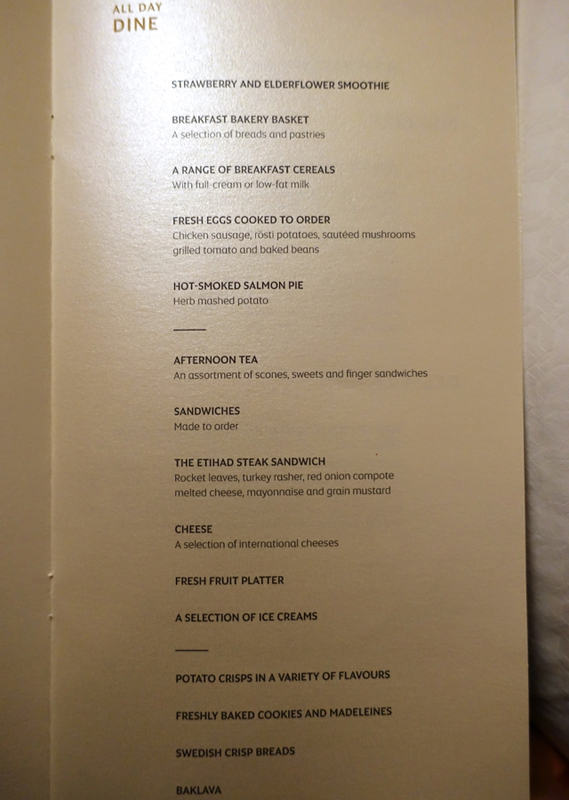 Since we'd just dined in the lounge and were both tired, we delayed our dining until later in the flight, although, since the cabin was full, we did ask them to save certain items for us. After we woke up, my son wanted breakfast fare, so he asked for yogurt with cereal and fresh berries. 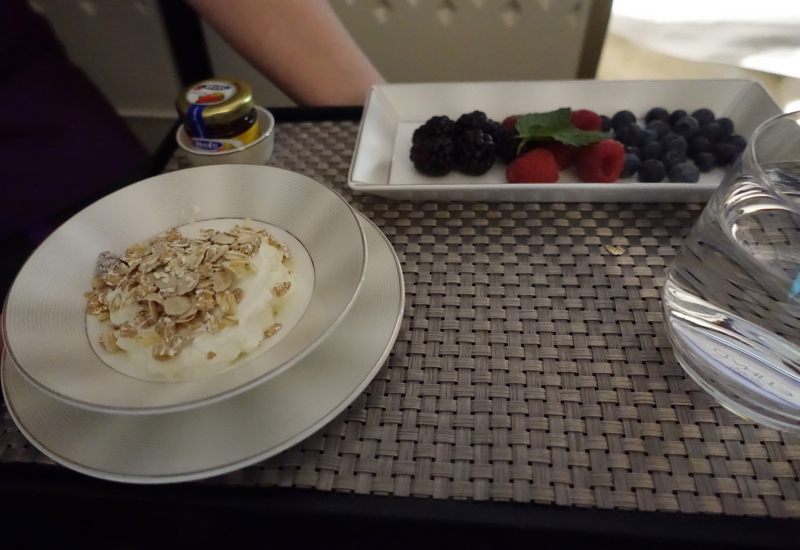 The yogurt was plain, but jam and honey were available to sweeten it, and the yogurt and berries were delicious. One of the blueberries had a tiny bit of mold on it, but all the other berries were in perfect condition. 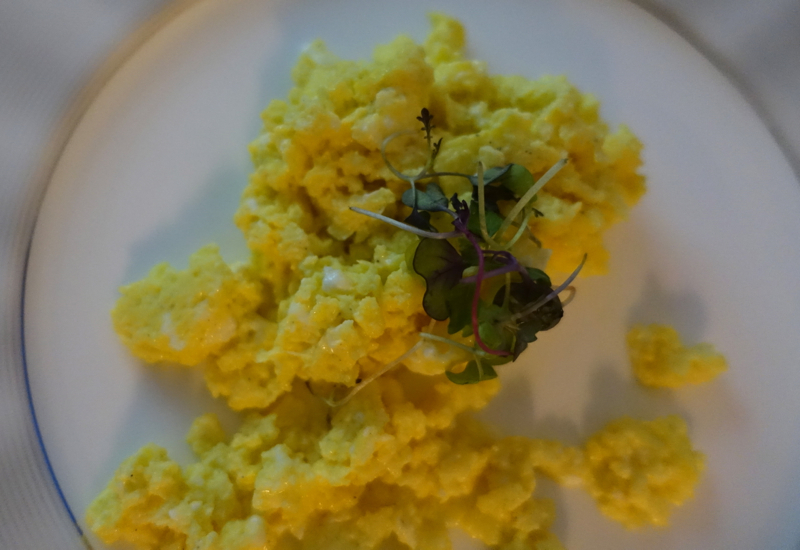 Next, he had scrambled eggs. I only managed a photo after he'd taken a few bites, so while it looks messy in the photo, it was presented nicely. 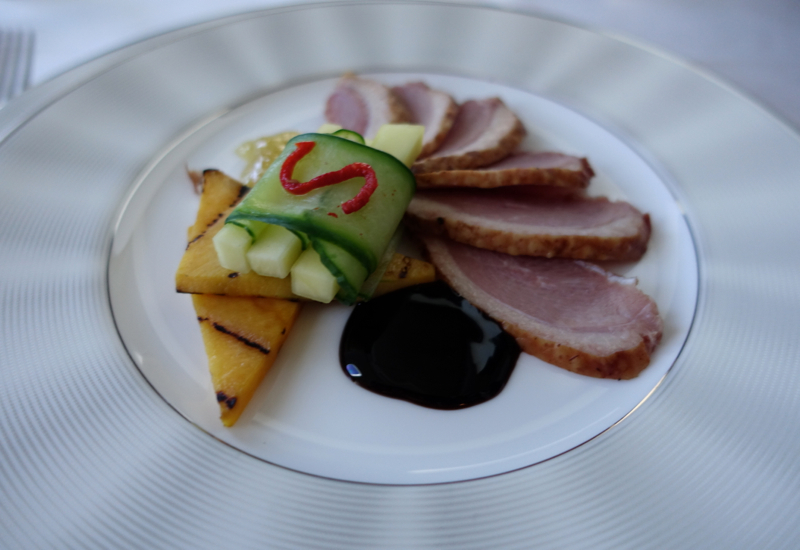 Following this was an appetizer of smoked duck breast with a spicy fig mustard sauce–also very delicious. 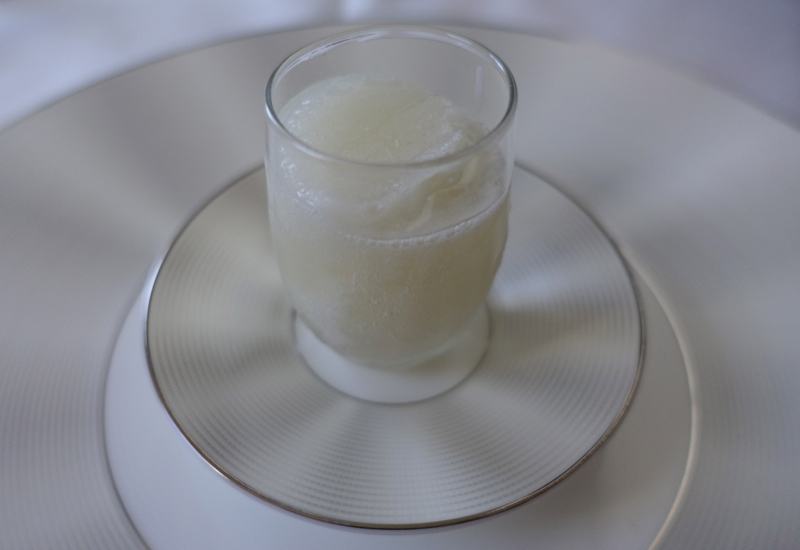 Afterwards came a lemon sorbet palate cleanser. 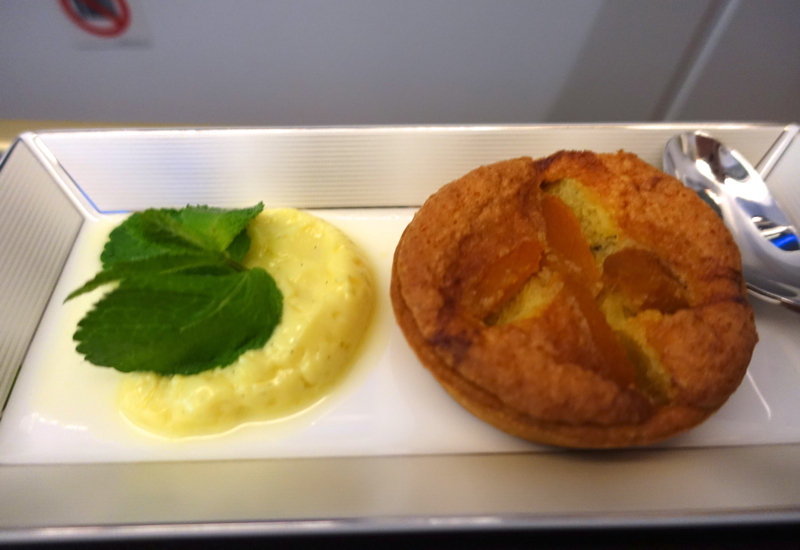 Very few airlines, even in first class, offer a sorbet palate cleanser, and this one was excellent. 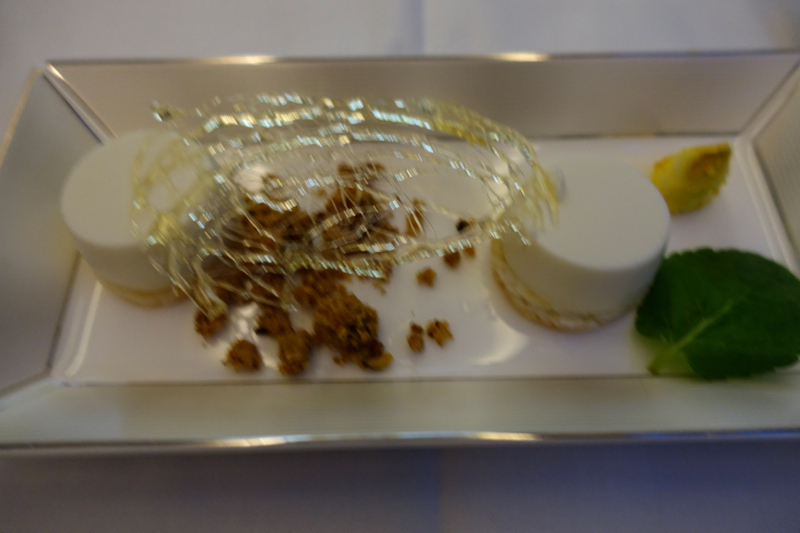 With this type of attention to detail for dining, I can't figure out why the amenity kit is so lacking. 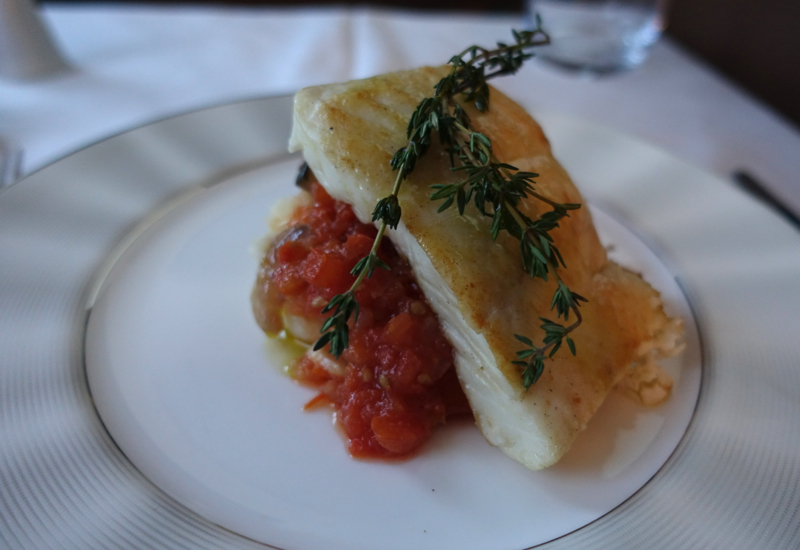 Meats tend to be very good on Etihad, but I was more in the mood for fish, which I realize is usually a poor choice on airlines. The chef recommended it however, saying it was a very fresh sea bass, and it was a solid dish, even though it was, as is typical, just slightly overcooked. It came with a good ratatouille type accompaniment. 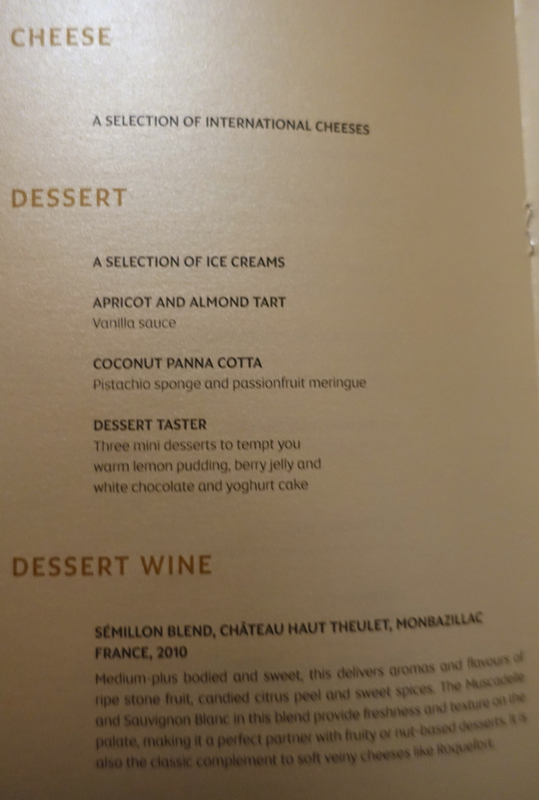 And for the sake of trying something different, I chose the coconut panna cotta, even though panna cotta is far from my favorite dessert. This version was creamier and better than the version we'd had in the Etihad Lounge. Both my son and I appreciated how quickly the flight attendants provided turn down service after the seatbelt signs were turned off, and while we were brushing our teeth. 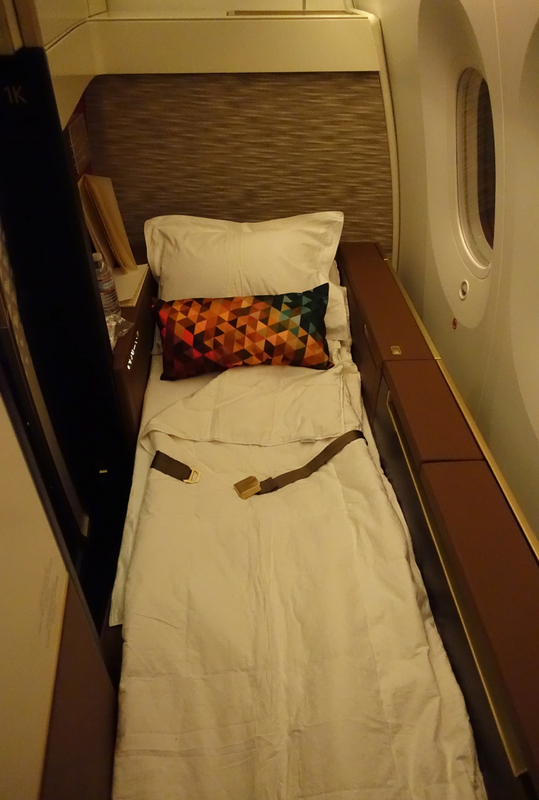 Etihad's bed is a good size length, at 6 feet 8 inches, and a Coco Mat mattress pad is used. 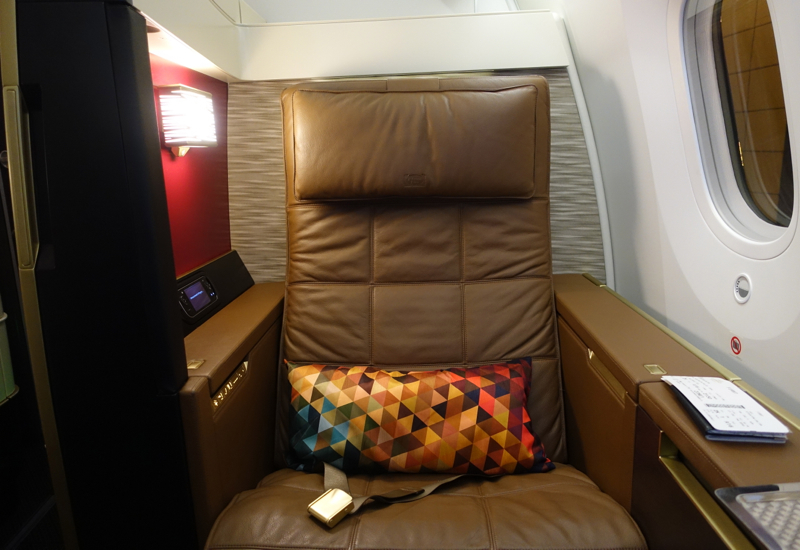 The mattress pad is still fairly thin–nothing like the memory foam Singapore Suites uses or the Airweave mattress JAL First Class and even JAL Business Class use, but we were both tired enough to sleep a full 8 hours. 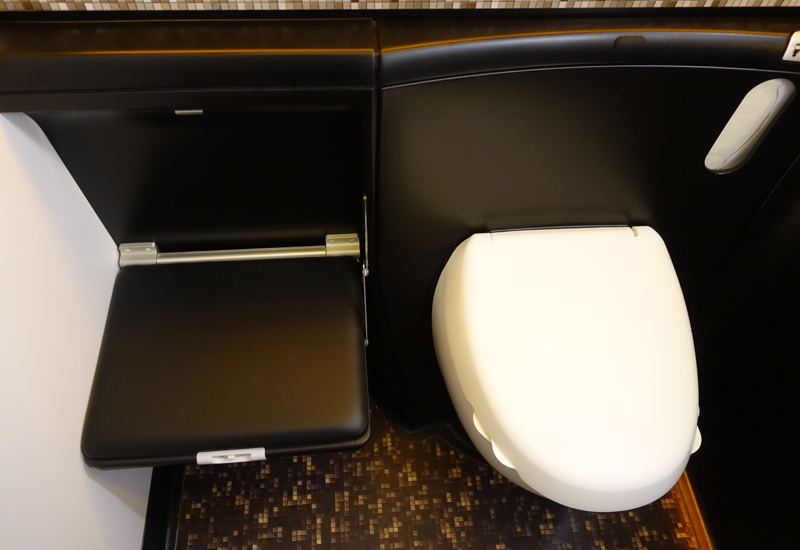 The First Class Bathrooms on Etihad's 787-9 aren't quite as large as the changing room I remember on the 777-300ER, but a nice touch is that there's a fold down seat next to the toilet. This is helpful if you need to bring a young child with you to the bathroom; there's also a fold down changing table. There are no fresh flowers in the bathroom, which is fairly plain, apart from the geometric design element. The amenities on our flight were Le Labo Bergamote, and included a facial cleanser, toner and moisturizer; there was also hand sanitizer. 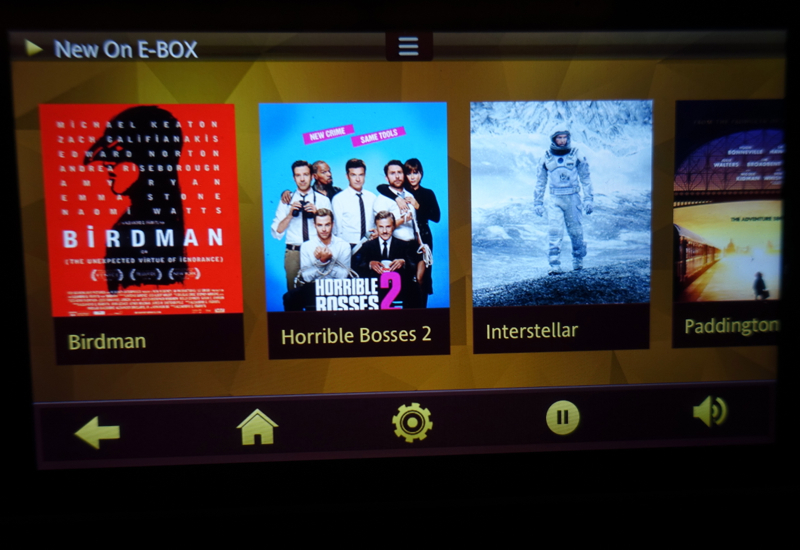 If you're used to Singapore's on demand IFE, you're going to be disappointed with Etihad's E-Box, which is surprisingly limited when it comes to films. I'd seen most of the new releases offered that were ones I was interested in, and gave up on both The Judge and To Die For after about half an hour. I was also surprised by the lack of kids' movie options. There were about 5 choices, ranging from Frozen (not exactly top of the list for a 7 year old boy) to Happy Feet and Wreck It Ralph. West Side Story was also for some reason included in the kids' movies, although not exactly appropriate for very young children. Given the dearth of attractive film options, I was happy that complimentary WiFi was offered. The card with the passcode was located in the case with the noise cancelling headsets, and simple email checking was fine, although the speed was too slow to deal with even modestly sized file uploads. On many first class flights, you're personally greeted sometime before take-off by the flight purser. While that didn't happen this time, I did meet her later in the flight, and the on-board chef, a friendly Belgian, introduced himself and assured us that we could dine whenever we wished, and he would be happy to help with any special requests. Service is not as proactive as on Singapore Airlines, but the attendants were helpful whenever asked. Overall, apart from the headset glitches and insufficient IFE choices, we were very pleased with our overall Etihad First Class in-flight experience, which I'd place above the in-flight experience of Lufthansa First Class, British Airways First Class, Thai First Class, and Asiana First Class, but slightly below Cathay First Class and more significantly below Singapore Suites. 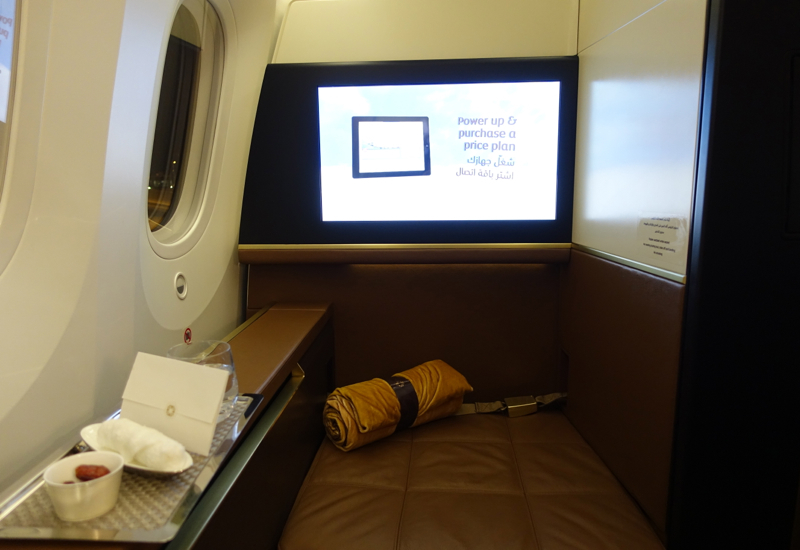 Of course, if you're more reliant than we are on the IFE, you may want to avoid Etihad's 787-9. 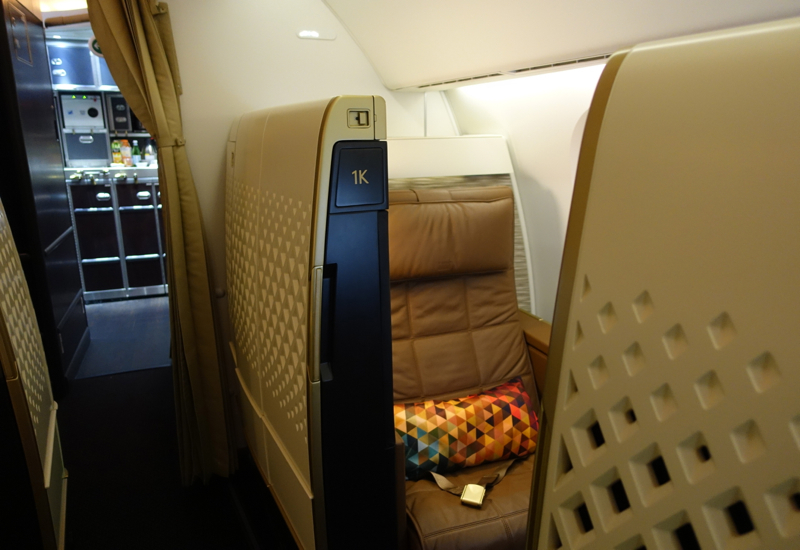 If you've flown Etihad First Class on the 787-9 recently, what was your experience?